The maximum loan amount for Missouri first time borrowers is $1,000 and for loyal customers can go as high as $1,500 (depending on your Kener Status). The minimum for Missouri customers is $500.00. The minimum loan term is 6 months, and the maximum loan term is 30 months. You will pay a specific amount every payment (calculated APR % depends on applicant). Every payment will be depending on the pay dates (every two weeks, weekly, or twice a month). All payments will be debited automatically. You may pay your loan in full at any given time and stop paying fees & interest. You may request changes by sending email to info@kenerlending.com or calling our customer service team. Note that your first payment will be due on your next pay date that falls between 8 to 35 days away (e.g. if your upcoming salary due is in 6 days your loan will be debited on your next pay date two weeks after). If your salary date falls outside of these ranges, your loan will be due within 14 days. You have the right to rescind your loan within 3 days of signing your loan contracts. To access the cancelation forms, click here. This business is licensed and examined by the State of Missouri Consumer Credit. Call the Consumer Credit Hotline or write for credit information or assistance with credit problems. Missouri Division of Finance, Truman State Office Building, Room 630, Jefferson City, MO 65102 (573) 751-3242 (573) 751-9192 (fax) E-mail: finance@dof.mo.gov. 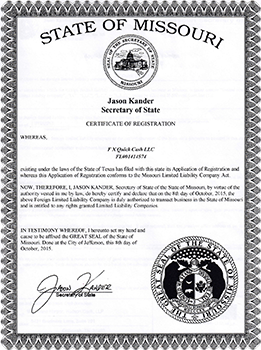 FX Quick Cash, LLC DBA Kener Lending will not be the lender for loans received at this site. Kener Lending is a Credit Access Business. We will attempt to arrange a loan between you and a third party lender and service that loan once it is issued. Any questions, service issues or complaints about your loan will be addressed by Kener Lending and not by the lender. The maximum loan amount for first time borrowers is $500 and for loyal customers can go as high as $1,500 (depending on your Kener Status). You may pay your loan in full at any given time and will be given a courtesy email when a payment is due. Assuming you do not contact us prior to a due date your loan is set to refinance automatically meaning only the fees will be debited and your loan principal will be rolled over to your next pay day ("Loan refinances"). After 4 re-finances have been made your loan will be debited in full on the 5th payment. Note that your first payment will be due on your next pay date that falls between 8 to 35 days away (e.g. if your upcoming payday is in 6 days your loan will be due on your next payday two weeks after). If your salary date fall outside of these ranges, your loan will be due within 14 days. 1. You have the right to repay your loan in full at any time (on your due date or before), without early payment penalties. 2. You have the right to make partial principal payments at any time. 3. If you do not contact us prior to your due date we will refinance the loan principal automatically 4 times. Kener will process a new Credit Access Fee and lender interest on each refinances. After 4 refinances, the full balance of the loan will be automatically debited on the 5th payment. After you have extended your loan due date four times, you may be eligible for an extended payment plan. For more information on the extended payment plan click here. You may request these changes by sending an email to info@kenerlending.com or calling our customer service team. For more information on extensions visit our FAQ page. Your Credit Access Business fee are $25 per $100 borrowed for every calculation period ($125 for the full duration). If your Kener Status is Silver or more you will be eligible for a discount on these fees. see Kener Status page for more information. In addition to the fee, you will also be charged an interest by your lender of 10.00% APR on loan principal (which will be determined by your loan term). Click here to find fee schedules for three common loan amounts offered to our customers. These three links lead to disclosures, required by the state of Texas for all residents applying for a CAB loan or an extension, which outlines the total costs associated with a payday loan of 5 bi-weekly payments of different amounts. 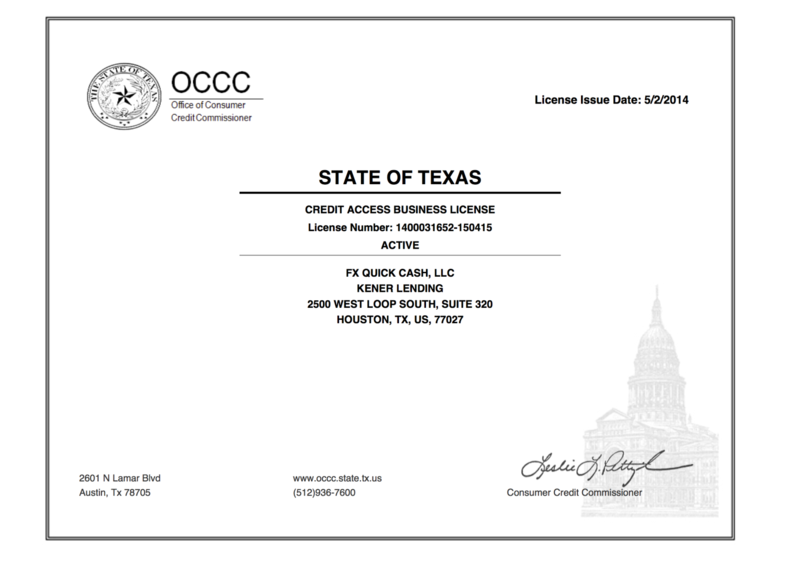 This business is licensed and examined by the State of Texas – Office of Consumer Credit Commissioner. Call the Consumer Credit Hotline or write for credit information or assistance with credit problems. Office of Consumer Credit Commissioner, 2601 North Lamar Boulevard, Austin, Texas 78705-4207, (800) 538-1579, consumer.complaints@occc.state.tx.us, www.occc.state.tx.us.